This may be the hardest review I have ever had to write. Thing is, we were all excited for this to come out, and when it finally did the cries of let down were heard quite loudly. Not only that, but given how late in the game this review is, one almost has to wonder if anything can be said that has not been already. Finally Technics has ignored our requests for a review unit for over a year and a half, making it so I had to borrow one from work to even be able to complete this! That said I feel that the DZ has got some bad press that is not deserved, as well as some bad press that has been missed. And so, on with the show. First thing of note-out of the box the DZ may be one of the sexiest machines ever to hit the DJ world. With an almost laser disc-like shine to it’s platter and a an equally beautiful screen, one can’t help but be in awe of how many things the designers got right. 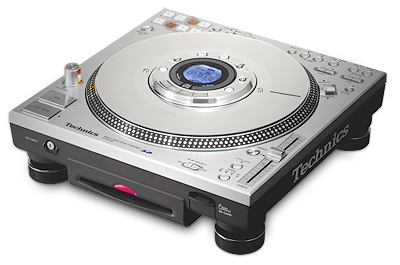 Surrounding the 10-inch platter (of note because of the fact that it is the same size as it’s Pioneer and Denon competitors which only have 7-inch platters) are the usual start/cue buttons, pitch fader, and 2 banks of cue/sample buttons, split into 4 button banks. All track rewind/advance controls, display orientation, etc are around the center display and in the top left corner sit the effect controls, split into “vinyl emulation” and “platter effect” banks. Rounding out the controls, a stop time dial sits on the rear and the eject button sits on the front panel next to the disc slot. When one first starts the DZ, it really can’t help but be noticed how strong the motor is compared to some of it’s moving platter competitors. Sharing the same motor as the sl-1200, on first impression one would think that things couldn’t go wrong based on this fact alone. While on the SL-1200 the 1.6kg motor may not seem like much compared to it’s more modern competition, keep in mind that on a 10-inch platter it simply feels like more. That said though, any advantage seen by the use of such a strong motor is soon taken away by the simply bizarre platter assembly. The outer ring of the platter is actually in no way connected to the inner platter-the “record” actually sits on a separately spinning platform that feels quite laggy when compared to the platter. The “record” itself isn’t even needed, as it is held to the real control platter by 2 pins, and really only seems to serve an ascetic purpose, much like a fake maple veneer on a cheap Les Paul knockoff. Remove it and except for looks and a couple small holes in the platter, you really lose nothing. On forward and backward movements, there is a noticeable “click” of dead space, where it seems like the platter isn’t even responding to your movements. Doing uzi’s almost confirms this-what should sound like short bursts instead sounds like a garbled mess. Stabs/drumming fare little better, as the platter has a noticeable drrrraaagg when getting back up to speed. The only cuts that really do not seem to be effected by the laggy platter action are tears and other cuts where your hand does not leave the platter much. Speaking of cuts, while the platter size is 10 inch, due to the screen position the usable platter space may actually be less than it’s 7 inch competition!! While the platter does have a visual indicator for cueing, one has to be careful not to completely rely on this small black line, as the engineers seem to have thrown a stopgap in to compensate for the laggy platter response, called “instant response”. When engaged, there is no drag up upon start, and the formerly useless reverse feature (about as far from instant as one can get) become instant, and at first the response to the play/pause buttons feels noticeably zippier. That said though, while the audio response to your button presses is instant, the platter response is not! Cue points are lost, making any benefit from the instant response button a wash with what your lose. As for how it sounds, well……fast cuts sound just fine, I will say that. On closer inspection of slow speed movements though, I noticed digital artifacts that were almost as bad as some first generation scratchable CD players, almost reminding me of how Final Scratch 1.0 sounded. Also, while it has been beat into the ground, I have to mention the oft-complained about key correct/scratch flaw. When you scratch with the key correct turned on, it sounds like digital garbage, pure and simple, making using it when doing scratch/trick mixing a nono. 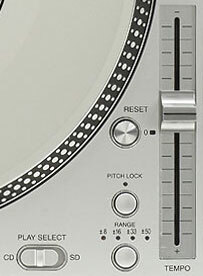 Well, we have established it’s flaws when scratching, but what about all the mix DJ’s who always wanted a digital 1200? Does it far any better? Well, the answer is “sort of”. One thing I have to mention is that the cue system may be the best ever to appear on a DJ CD player, bar none. Instead of setting the cue point through a shared loop button or through an odd system of pausing/starting, the cue points are set simply with a “record” button. Really, it blows my mind that no one thought of this before as it really is amazing how easy it can make life. The record button is also shared with the hot start/sampler section, making recording samples/hot cues super intuitive. 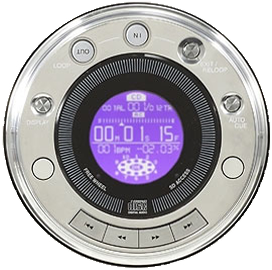 Sample volume and length can be controlled from the main menu, and any record movements can be recorded in real time. 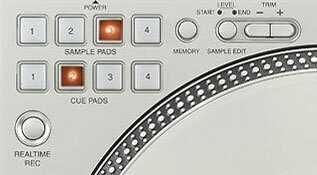 Samples and cue points can even be saved on an SD card for travel, which is notable in that currently only the CDJ1000 offers this same facility. If we were basing this review on the cue section, the DZ would receive a 8, no question. It would receive a 10, but somehow they forgot to include the ability to edit seamless loops from within the loop, which has been a staple since the first introduction of seamless looping!! The effects section is an interesting beast, as many reviews I have read state that the effects cannot be edited which is simply not the case. They can be edited and sound quite good, though to edit them you need to actually turn the CD player over from vinyl to CDJ mode, which makes the platter function only as an effect jog (pitch bending is not available, unlike other players with “CDJ” modes). It is also best to plan pre-song if you will use the effects or not, as once within a song if you switch the song will suddenly stop! How they made this oversight is beyond me, as it makes DJ’s choose effects over scratching. While some of the effects, such as the pan (self explanatory) and the air hammer (transform) effect are kind of lame, the TT WAH is a decent enough filter, and the One Way effect is similar to the Denon “forward scratch” mode. As for the “Vinyl Simulation” modes, really these are eq curves based on various sounds such as playing your music through a telephone, or a bass boost mode which is somehow labeled “1200”. While I am sure some DJ out there will find these effects to be the bee’s knees, really I have a hard time finding any use. I really wanted to write this review and tell you that everyone was wrong, that the DZ1200 is amazing and that it is the player that Technics should have made years ago. That said it in some ways feels like a group of engineers got together in a room with a couple pages of notes on what they heard DJ’s want and then went about their business without actually getting anyone involved in the actual design process. Built like a tank, if I were a touring DJ I would totally consider one, but for studio use it would not do the trick. 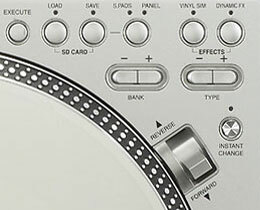 Technics-now we know why you never sent us a unit. Sorry I couldn’t ease your fears.